Right now driving around Central PA the farm stands are all open and there is one piece of produce that is at peak: Strawberries. 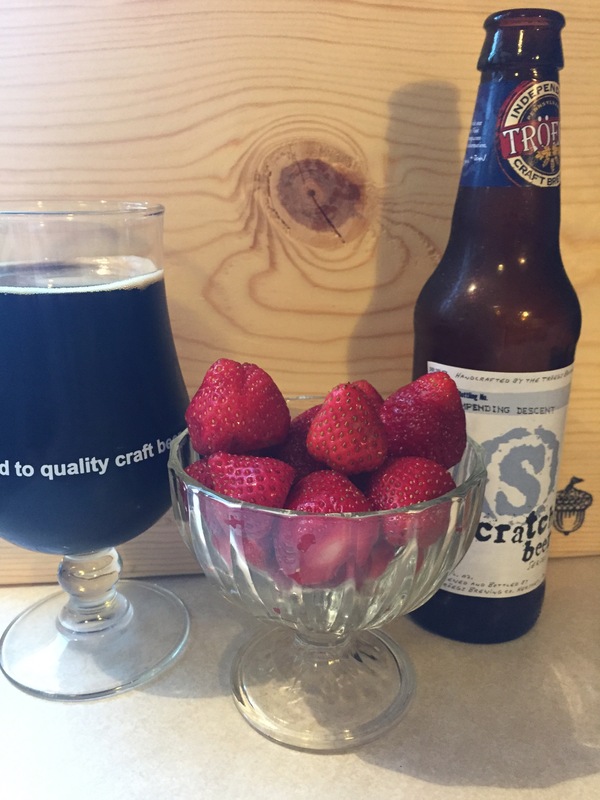 Let us forget for a minute my last post about summer beer and their light and crisp flavor profile and instead focus on what pairs right with a fresh bowl of ripe red sweet and slightly tart strawberries. In my opinion these tend to be malty, heavier beers that contrast the natural flavors of the berries. My fist pick is ¿Impending Descent? by Troegs. This gonzo Russian Imperial Stout gets released each November so I buy in bulk to enjoy it on occasion throughout the year and have been ageing a large number as a running vertical. If you have one tucked away, pairing it with some fresh local strawberries will work out perfectly. The copious amount of malts (six varieties) provide for various flavors of dark chocolate, vanilla, and coffee. The roasted malts work wonderfully with the sweet tart fruit. 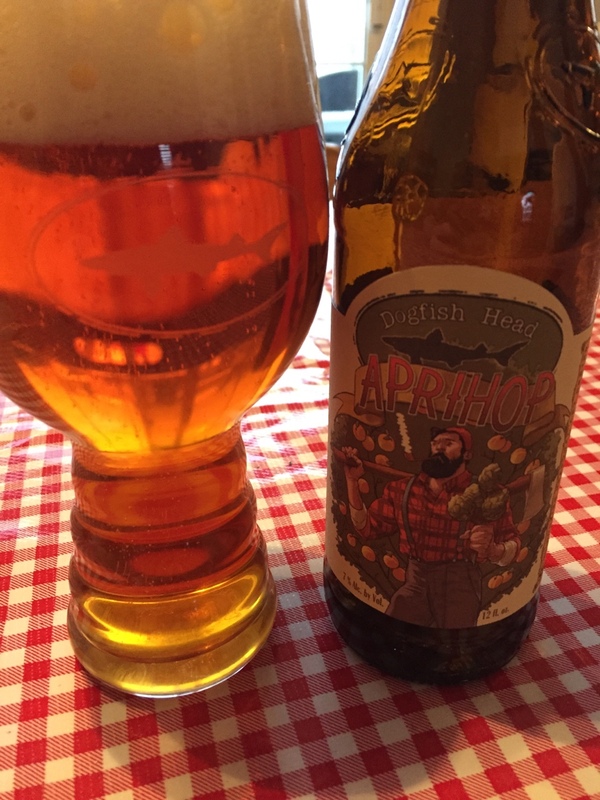 If this beer has been cellaring for a time the pine and resin hop notes will have muted and left a perfect pairing. If you can’t get a hand on ¿Impending Descent? I suggest picking up the always available Javahead Stout or racing out to the Hershey brewer right quick and picking up a growler of Scratch #192 a velvety smooth and decadent chocolate stout. Palo Santo Marron by Dogfish Head Brewing will pair nicely. The caramel, vanilla, and wood flavors from this 12% ABV brown ale will marry wonderfully. The roasted notes along with molasses and a round mouth feel just work. This is a world class beer and would be right at home with a scoop of vanilla ice cream and some strawberries. Samuel Smith Organic Strawberry Ale is a wonderfully crisp and tart fruit beer from the world famous English brewers. Smooth malts with a soft mouth feel and subtle strawberry finish will be intensified by local fresh berries. This beer is easy drinking at 5% ABV. I would pair this with a strawberry and baby spinach salad with a light poppy dressing for dinner. 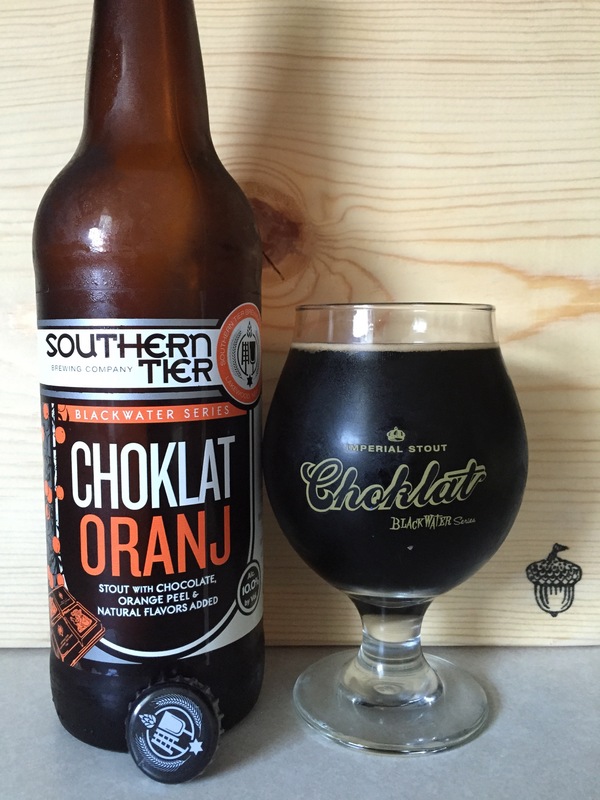 After dinner consider opening a bottle of Southern Tier’s Crème Brulee Imperial Milk Stout. This beer is the pinnacle of Southern Tier’s very highly regarded Blackwater Series in my opinion. Remarkably this beer tastes exactly like its name sake. In fact, it is downright magical in likeness. Cream, vanilla, and burnt sugar come straight through with a long sweet lasting finish. This 9.6% ABV full bodied beer has an exceptional mouthfeel and would be a fine addition to a strawberry shortcake dessert. Shortly after I bought my first home eight years ago I started cellaring beer. 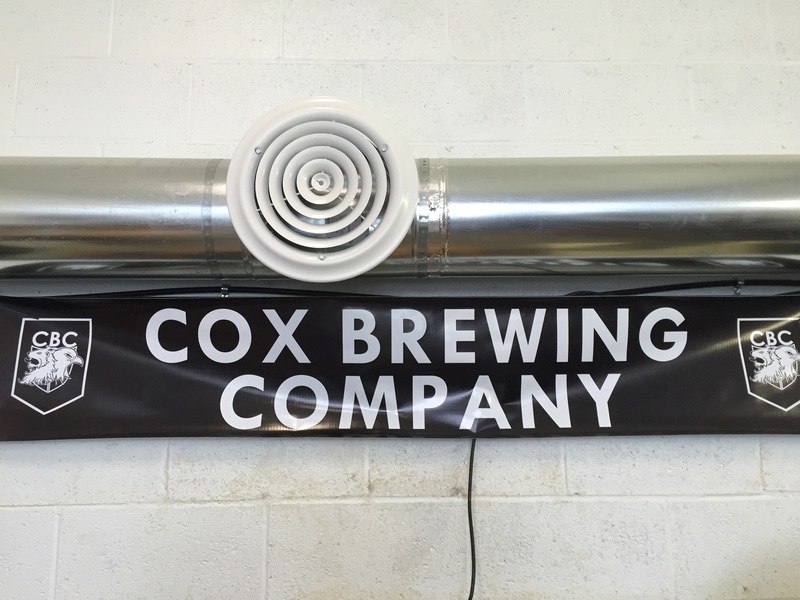 I had heard of the practice and it seemed like the perfect way to expand my interests in rare and unusual beers by making some of the best beers of today potentially even better. First off… I am no expert on aging beers. That being said there are a few rules I work around and they have worked for me. The storage space should be cool. My basement is quite cool year round and never gets above 60 degrees. It should be dark. Beer is as photosensitive as an albino in the tropics. I use wine boxes and some old blankets. Choose boozy beers. 8% ABV and above. Hops are fragile and their floral, dank, piney, resin, citrus and/or tropical flavors degrade quickly. This will make you sad. Pick something else. I like to generally work with dark beers… Imperial stouts, barley-wines, Belgian strong ales, sour beers, Flanders reds work but so can Triples and Quads. Bottle conditioned beers and those injected with wild yeast or Brettanomyces tend to offer good results. Try to run a vertical. Age a couple bottles from each year and then try them together to get an idea of how the beer is developing during its long slumber. This is great for learning about when a beer reaches “maturity” and when its over the hill. Experiment… some will work and some will not. Failure is an option. Some will be sublime and some will be ready to hit the drain. It’s a crapshoot; get over it. I ran into that the dichotomy of that last bullet point this past week. First, I opened a bottle of SlyFox’s Black Raspberry Reserve from 2010. 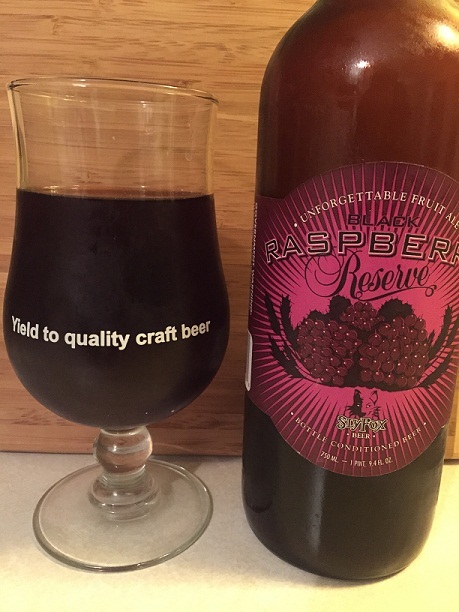 This bottle conditioned fruit beer weighs in at 8% ABV, is loaded with raspberries and is brewed in Phoenixville, PA. I first had this beer fresh and I found it overly sweet and lacking sufficient complexity in flavor. It was a little on the thin side but its effervescence made for nice mouthfeel. It poured a deep rich purple with a slightly pink head. Flavors were only slightly tart and that was drowning in sweet sugars and candied raspberry. I thought the beer promising if only the tartness could be amplified, the sweetness muted and some of the other potential fruity flavors given a chance to come forward. So in the cellar it went for nearly five full years. Upon opening the cork and caged 750 mL bottle and pouring it in to a snifter I could tell the long rest had made significant changes. This beer previously had a luminance about it. The color had clearly moved towards a darker more brownish hue; not immediately off putting but certainly different. The bubbly effervescent liquid was now flat and thin. The aroma once of raspberry jam was now only a whiff of its former self. It was bland at the front with no discernable finish. The beer lacked any real flavor. The beer was boring. Age had not been kind this beer. What was once a modestly good beer, with what I had hoped to be great potential, was lost for good. 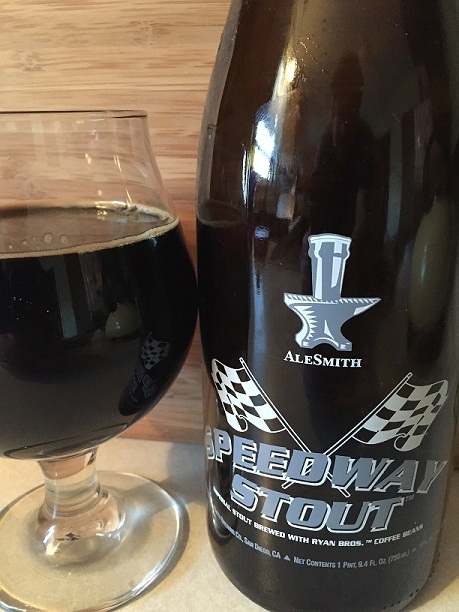 The second bottle I opened was a 2011 Speedway Stout by AleSmith out of San Diego California. AleSmith makes a number of very, very well regarded brews and is a company that I trust completely with my hard earned beer money. When fresh this imperial stout pours a pitch-black with chocolate and coffee aroma’s dominating the nose. The taste of coffee and chocolate are dominate but do not hide the subtle toffee, caramel, vanilla and dark sweet fruits notes. These all come through thanks to the fine and abundant carbonation. 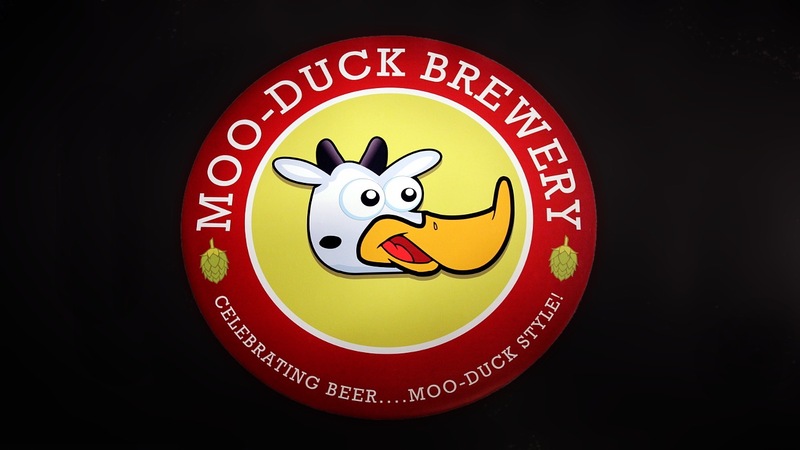 This beer is silky smooth and very easy to drink even at 12% ABV. My 2011 bottle after four years of hibernation showed significant and welcome change. The beer pours slightly flatter with the previously firm dark brown head disappearing quickly and only providing minimal lacing at the edge. The creamy mouth feel was replaced with the smooth silk like texture of a fine cordial. With the coffee notes completely out of the way after its four year slumber the beer now focused on the roasted malts. Toffee, caramel, and vanilla are all here in abundance but never over powering. The 12% alcohol is more evident but never lends itself to a burn or unpleasant astringency and merely invites more rationed sipping; a wise credit to my patience. The finish is as long as ever but instead of coffee now evokes the flavors of softly roasted malts and a hint of plums. The beer was and remains complex and is never boring. I am glad to have two more bottle to see what another five to ten years does. Speedway Stout and cellaring your beers both get the Bearcat Seal of Approval.